Order of the Aztec Eagle pada 2010. 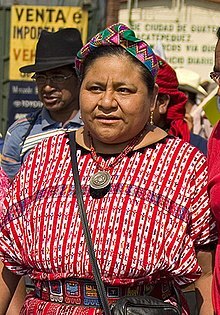 Rigoberta Menchú Tum (Sebutan Sepanyol: [riɣoˈβeɾta menˈtʃu]; lahir 9 Januari 1959) ialah aktivis politik dan hak asasi K'iche dari Guatemala. Menchú telah mendedikasikan hidupnya untuk mempublikasikan hak-hak kaum feminis asal Guatemala semasa dan selepas Perang Saudara Guatemala (1960-1996), dan untuk mempromosikan hak-hak pribumi di negara ini. Beliau menerima Hadiah Keamanan Nobel pada tahun 1992 dan Anugerah Putera Asturias pada tahun 1998. Beliau ialah subjek dari biografi testimoni I, Rigoberta Menchú (1983) dan penulis karya autobiografi, Crossing Borders. Menchú merupakan Duta Muhibah UNESCO. Beliau juga telah menjadi tokoh dalam parti politik pribumi dan bertanding untuk Presiden Guatemala pada tahun 2007 dan 2011. ^ Irwin Abrams, The Nobel Peace Prize and the Laureates: An Illustrated Biographical History, Watson Publishing International, 2001, p. 296. ^ "Menchú Tum, Rigoberta". UNHCR. United Nations High Commissioner for Refugees. Diarkibkan daripada asal pada 4 June 2016. Dicapai 14 May 2016. ^ Reuters, From (1999-12-03). "Activist Asks Spain to Pursue Guatemala Case". Los Angeles Times (dalam bahasa Inggeris). ISSN 0458-3035. Dicapai 2018-10-04. ^ "Spain seeks Guatemalan ex-rulers". BBC News. 23 December 2006. Dicapai 27 November 2017. ^ Grandin, Greg. "Rigoberta Menchú Vindicated". The Nation. Dicapai 27 November 2017. Ament, Gail. "Recent Maya Incursions into Guatemalan Literary Historiography". Literary Cultures of Latin America: A Comparative History. Eds. Mario J. Valdés & Djelal Kadir. 3 Vols. Vol 1: Configurations of Literary Culture. Oxford: Oxford University Press, 2004: I: 216–215. Arias, Arturo. "After the Rigoberta Menchú Controversy: Lessons Learned About the Nature of Subalternity and the Specifics of the Indigenous Subject" MLN 117.2 (2002): 481–505. Beverley, John. "The Real Thing (Our Rigoberta)" Modern Language Quarterly 57:2 (June 1996): 129–235. Brittin, Alice A. "Close Encounters of the Third World Kind: Rigoberta Menchu and Elisabeth Burgos's Me llamo Rigoberta Menchu". Latin American Perspectives, Vol. 22, No. 4, Redefining Democracy: Cuba and Chiapas (Autumn, 1995), pp. 100–114. De Valdés, María Elena. "The Discourse of the Other: Testimonio and the Fiction of the Maya." Bulletin of Hispanic Studies (Liverpool), LXXIII (1996): 79–90. Feal, Rosemary Geisdorfer. "Women Writers into the Mainstream: Contemporary Latin American Narrative". Philosophy and Literature in Latin America. Eds. Jorge J.E. Gracia and Mireya Camurati. New York: State University of New York, 1989. An overview of women in contemporary Latin American letters. Golden, Tim. "Guatemalan Indian Wins the Nobel Peace Prize": New York Times (17 October 1992):p.A1,A5. Golden, Tim. "Guatemalan to Fight On With Nobel as Trumpet": New York Times (19 October 1992):p.A5. Gossen, Gary H. "Rigoberta Menchu and Her Epic Narrative". Latin American Perspectives, Vol. 26, No. 6, If Truth Be Told: A Forum on David Stoll's "Rigoberta Menchu and the Story of All Poor Guatemalans" (Nov., 1999), pp. 64–69. Millay, Amy Nauss. Voices from the Fuente Viva: The Effect of Orality in Twentieth-Century Spanish American Narrative. Lewisburg: Bucknell University Press, 2005. Logan, Kathleen. "Personal Testimony: Latin American Women Telling Their Lives". Latin American Research Review 32.1 (1997): 199–211. Review Essay. Nelan, Bruce W. "Striking Against Racism". Time 140:61 (26 October 1992): p. 61. Stanford, Victoria. "Between Rigoberta Menchu and La Violencia: Deconstructing David Stoll's History of Guatemala" Latin American Perspectives 26.6, If Truth Be Told: A Forum on David Stoll's "Rigoberta Menchu and the Story of All Poor Guatemalans" (Nov., 1999), pp. 38–46. ---. "From I, Rigoberta to the Commissioning of Truth Maya Women and the Reshaping of Guatemalan History". Cultural Critique 47 (2001) 16–53. Sommer, Doris. "Rigoberta's Secrets" Latin American Perspectives, Vol. 18, No. 3, Voices of the Voiceless in Testimonial Literature, Part I. (Summer, 1991), pp. 32–50. ---. "Slaps and Embraces: A Rhetoric of Particularism". The Latin American Subaltern Studies Reader. Ed. Iliana Rodríguez. Durham: Duke University Press, 2001. Ward, Thomas. La resistencia cultural: la nación en el ensayo de las Américas. Lima: Universidad Ricardo Palma, 2004: 285–302. Wise, R. Todd. "Native American Testimonio: The Shared Vision of Black Elk and Rigoberta Menchú". In Christianity and Literature, Volume 45, Issue No.1 (Autumn 1995). Zimmerman, Marc. "Rigoberta Menchú After the Nobel: From Militant Narrative to Postmodern Politics". The Latin American Subaltern Studies Reader. Durham: Duke University Press, 2001. "Liar, Rigoberta Menchu" by Dinesh D'Souza, Boundless webzine, 1999. Sound recording of Elizabeth Burgos-Debray interviewing Rigoberta Menchu. Laman ini diubah buat kali terakhir pada 03:34, 22 Oktober 2018.